Thursday’s Set Points post is a round-up of second round action from San Jose and Washington across Wednesday and Thursday. The two tournaments have been experiencing contrasting fortunes with the weather as Washington has had rain every day this week and Thursday was the worst of the lot. The women are still on schedule though. Read on for 10 stories in Thursday’s Set Points post. Elise Mertens began her summer hard court season with a comfortable 6-2 6-0 win over the American wild card, Ashley Kratzer. Kratzer was very erratic and wasteful on her three break point opportunities in the opening set. Ultimately, Mertens’s quality and experience shone through. Mertens, who is now working with Madison Keys’s former coach, Dieter Kindlmann, will face Johanna Konta in an intriguing quarter-final. In their only previous meeting, Konta beat Mertens in Miami earlier this year, 6-2 6-1. Elise Mertens on court now @MubadalaSVC, playing her 1st tournament with new coach Dieter Kindlmann. Danielle Collins is continuing her strong season after a 6-1 3-6 6-1 win over Vera Lapko. The American has reached at least the quarter-finals at five of her last seven tournaments on hard court. While Collins hasn’t had a stand-out result since reaching the semi-finals in Miami, she has continued to rack up the wins since March and maintained a positive record with 11 wins to 8 losses. Collins’s intensity is a big strength and it was a drop in this area that allowed an improved Lapko to force a third set. I can’t say i’m a fan though of the occasional loud screams from Collins when her opponent makes an unforced error. On a random note, I love the colours of her latest New Balance kit. Mihaela Buzarnescu won her 13th three set match of 2018 with a 7-5 2-6 6-1 victory over the talented teen, Amanda Anisimova. It was one of those matches where neither was playing well at the same time. For the second match in a row, Buzarnescu was in tears in between the second and third sets. For the second time in a row she reset marvellously well to cruise through the decider. She’s a hoot! My favourite moment of the third set was Buzarnescu lamenting herself and starting to lose her rag after missing a break point… leading 4-0 😂. While it was an error-strewn third set performance by Anisimova, it was generally another impressive tournament for the 16-year-old, especially given it was first in four months due to a foot fracture. Of all the talented teens, Anisimova is still the one that impresses me the most. There were even little touches in this loss – after failing to serve out the first set, she looked gone at 0-2 in the second set. Suddenly she rolled off six straight games to force a decider! An almost flawless Maria Sakkari dropped just the one game in a thumping 6-0 6-1 win over Timea Babos. Sakkari missed four match points for the double bagel! Sakkari was just so consistent and served very well. A disintegrating Babos had no answers and didn’t really seem to try anything different as she became increasingly erratic. Sakkari has dropped just five games in two matches in San Jose and should go into her quarter-final match with bundles of confidence. Next up… Venus Williams. Andrea Petkovic came from a set and a break down to beat the number two seed, Sloane Stephens, 2-6 6-4 6-2. This was Petkovic’s first top ten win since beating Garbiñe Muguruza in Doha in 2016. I really didn’t expect this result because of how solid Stephens has been for much of the year on hard court and notably in her opener against Bethanie Mattek-Sands. Stephens began to fall away midway through the second set as Petkovic grew into the match. Stephens told her coach towards the end of the third set that she had no energy and that was clear to see. The American was laboured in her footwork and this contributed to her rapidly rising unforced error count against an assured, Petkovic. Petkovic has endured some tough times on tour over the past few years so this very much felt like a feel-good result. Petkovic is now into her first WTA quarter-final since… Washington last year! There were promising signs at the French Open where Petkovic pushed Simona Halep for a set before injury struck so I don’t think this was a one-off. The future is certainly looking brighter for Petko on the tennis court and i’m thrilled about that. Particularly liking the bottom half. Happy to see Kiick in the quarters after everything she has been through. It’s not been the best week in San Jose with the top two seeds, Garbiñe Muguruza and Madison Keys, both pulling out before their first matches. Muguruza pulled out with a right arm injury, while Keys, more concerningly, withdrew with a right wrist injury. After winning her first round match in Washington, Naomi Osaka reiterated her like of the hard courts, or as she called it, heart court! She also mentioned about choosing DC for getting used to playing night matches. She got to play at night on Thursday but lost her second round match to Magda Linette. A big thanks to Chad (@CCSMOOTH13 on Twitter) for all his great content from the tournament this week 👍. Let the baking season commence. 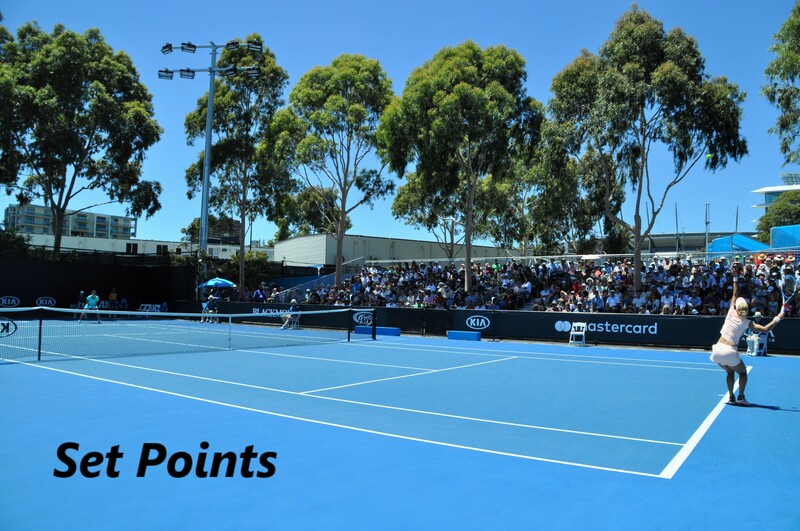 August 3, 2018 in San Jose, Set Points, Washington, WTA. Amanda’s game seems to be maturing nicely. She is playing at a much higher level than the last time I saw her. Although Amanda went off-the-boil a few times during the match, overall she played the quality hard hitting Doc Buz even. I would like to see Amanda play a pure defender. Doc Buz had what appeared to be another player talk to her during the occ, to calm her down, which I thought was a good move. When I first saw her a couple of years ago, I thought she would be perpetually ranked about 150. Now she is has a live ranking of 42 and appears to be a solid player. On the other hand, Vik——seva, who I thought would be the next big thing, appears to have plateaued out and not playing with any fire in her belly. I don’t understand CSN, R#27, being in the Qualies. A lot of good matches in the 1st round, which The Moo will no doubt expound on. If Mertens gets to the final in San Jose, she may pull out and Bouchard would face a Lucky Loser in the 1st round instead of Mertens.